“Mr. Peabody & Sherman” is an upcoming full-length computer-animated film based on characters of the animated series “The Rocky and Bulwinkle Show”. It is directed by Rob Minkoff who is famous as co-director of “The Lion King” and “Stuart Little”. Mr. Peabody is a an unusual dog. He’s faster than a calculator when it comes to calculating complex numbers, he understands complicated scientific researches and creates brilliant inventions. Mr. Peabody’s only problem is that he remains a common dog in spite of all his skills. That’s why, like any other dog, he has an owner – a boy named Sherman. Although in this case, Sherman was adopted by Mr.Peabody, and not the other way around. Mr. Peabody is a serious and calculated dog who doesnt jump into danger or act without thinking through all the pro’s and cons. Whereas Sherman is like any young boy who loves to go on adventures, who’s very curious about everything, a bit naïve and likes to push buttons. 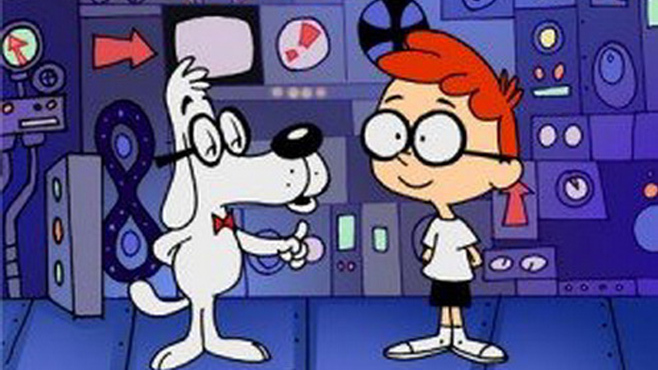 One day Sherman decided to travel on Mr. Peabody’s invention (Peabody’s time machine) together with his friend Penny. Driving it they made a hole in the Universe and some important history events disappeared because they tampered with time. Rescuing the past,present and future falls into the paws of Mr.Peabody, Sherman and Penny. Mr. Peabody is a super smart genius, who was born a beagle with a voice. He is a business-giant, inventor, scientist, gourmet chef, Olympic medalist, musician etc. The only thing which he still hasn’t perfected is being a parent for his adopted son Sherman. Sherman. Sherman has quite the interesting life since his adoptive father is a “scientist-dog”, who created a time machine, which allows Sherman to travel through time and discover exotic places. Penny. Penny laughed at Sherman and thought he was strange, but later, after he saved her from the wedding with Tutankhamun they became friends. Mrs. Grunion is a school consultant, the main antagonist. She threatened Peabody with suspension and once even tried to abduct Sherman. In the end of the film she got to Ancient Greece and married Agamemnon. Paul Peterson is Penny’s moody father, who didn’t like Sherman at first, but later became friends. Patty Peterson is Paul’s wife, a neutral character. Sherman and Peabody have 4 fingers in the TV-show, but in animation film only Peabody has 4 fingers. The original serial about Mr. Peabody appeared in the end of the 50s. Time machine in the cartoon is called “Wabac mchine”. In “The Simpsons” Mr. Peabody and Sherman appeared in the 6th season in the 6th episode, where Homer travels through time. Paul Smith offers essay writing services for students. Paul is fond of creating masterpieces. He can inspire you on Google+.